On the front side, the Nokia X6 is fitted with a 5.8-inch bezel-less display having a FHD+ resolution of 2280 x 1080 pixels. The display is shielded by a Corning Gorilla Glass against accidental damage and scratches. Design-wise, the X6 is made out of glass which feels premium in hands. The back of the phone houses vertical camera setup and a fingerprint scanner below it. Both are located in the middle. Sensors located on the device include accelerometer, proximity sensor, magnetometer and gyroscope. The Nokia X6 ships in three attractive color variants i.e. Black, Blue and White. On the imaging front, the Nokia X6 is equipped with a dual rear camera. It comprises of a 16MP f/2.0 primary RGB sensor and a 5MP f/2.2 monochrome sensor. The camera features face detection autofocus along with LED flash for better low light photography. There is a 16MP front facing camera for snapping selfies. The rear camera lets the user record Full HD videos (1080p). HMD has included the Bothie mode that allows the user to make use of the front and rear cameras simultaneously. Under the hood, the Nokia X6 houses a 1.8GHz Snapdragon 636 octa-core processor. It packs 3GB RAM with Adreno 509 graphics processor onboard which ensures smooth performance. The device offers 32GB internal storage which can be expanded up to 256GB via microSD card for additional storage. 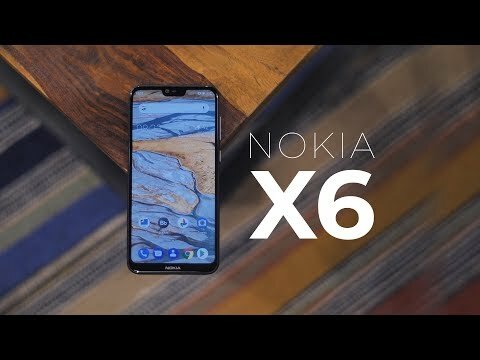 The Nokia X6 ships with pre-installed latest Android 8.0 Oreo OS out of the box. The Nokia X6 runs on a 3060 mAh non-removable battery coupled with Quick charge 3.0 for fast charging. As for connectivity, this phone offers dual SIM functionality and networking options include 4G LTE, 3G, 2G, WiFi, Bluetooth and VoLTE.